At Aesthetics we're always on the look out for amazing, talented people to join our team. Our current vacancies are listed below, so if you think you've got what it takes to be part of a first class, award-winning hair & beauty salon then please send us your CV and tell us why you should join us. Be trained by the best, to become the best, whilst working in a salon environment, covering NVQ levels 1 & 2. A rare opportunity to be paid while you train, with fantastic career opportunities on completion. Places limited. Aesthetics invests time & energy into our young, dynamic team. We value our apprentices as our stylists for the future. Aesthetics is looking for Beauty Therapists and Nail Technicians to join our dynamic and dedicated team. If you are a fully qualified and experienced Beauty Therapist or Nail Technician, have a warm and welcoming nature and a keen interest in career progression, then we want to hear from you. We are looking for a highly motivated, exceptional individual to work on our Front of House reception desk. You will need to be outgoing, friendly and highly customer focused with the ability to offer a six star concierge service. You and the reception team will be the initial point of contact for all clients, so you will need to be well presented with an exceptional telephone manner. 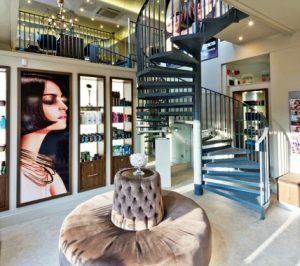 Aesthetics is one of Solihull’s busiest and most prestigious salons. You will have to be able to demonstrate strong organisational skills, be able to handle a high volume of client enquiries, whilst maintaining a keen eye for detail and have a good knowledge of computer skills. Previous customer service experience is essential within the hotel, beauty or leisure industries (at least 1 year). A friendly & professional appearance is required, as is computer knowledge. Aesthetics Solihull is looking for experienced Nail Technicians for our new state-of-the-art Beauty Rooms. You will have a passion for natural nail care with a Beauty Therapy NVQ Level 2 as well as excellent customer service skills and proven retail sales ability. If you would like to send us your details for consideration, please complete the following form or alternatively please call the salon on 0121 707 8866.